The rules of crate training are really quite simple, and if you follow them, housebreaking your puppy will be easy. Purchase your dog crate before you bring your new puppy home, and make sure you understand how to crate train a dog, as well. Never crate your dog as a punishment. Never force your dog into the crate. Never leave your dog in the crate for too long. After you’ve chosen the proper size crate you must decide where to place the crate. Avoid high traffic areas because Weimaraners are easily excited. However, it’s also a good idea to put the crate in a location near where you will be, so your Weimaraner doesn’t feel alone and isolated. Clean the crate often by vacuuming and (when necessary) use pet-safe cleaning products. 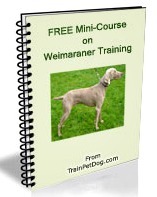 The amount of time it will take to crate train your Weimaraner will depend on your dog’s temperament, age, and possibly past experiences. Remember that crate training must be a positive happy experience for your dog. 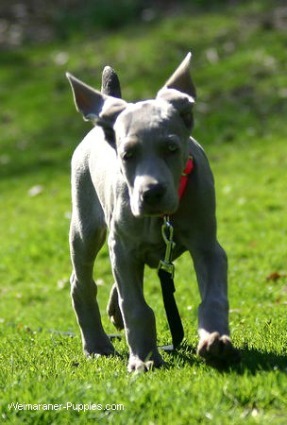 So be patient with your Weimaraner puppy and take it one step at a time. First things first, encourage your Weimaraner to go potty in a designated location outside, before you begin your crate training exercise. Introduce your puppy to the crate. Make the crate comfortable for your Weimaraner by placing a soft blanket and a couple of his/her toys inside the crate. Take your puppy over to the crate and let him explore his new crate. Keep the door open at this point. And try not to let it slam shut or make any noises that might frighten your little puppy. If your puppy is hesitant to go all the way inside the crate, place treats in to as far as he will go and keep increasing the distance until your pup finally reaches the back of the crate. Feed your puppy his/her meals in the crate. Since your puppy likes to eat, feeding in the crate will help establish a positive association with the crate. If your puppy is not comfortable going in the crate right away, you can start by placing his food dish right next to the crate. Gradually move the food dish inside the crate, and then in steps to the back of the crate. If your puppy isn’t willing to eat his food in the back of the crate, you might be moving too quickly. So take a step back and slow down until you can move the dish further into the crate. Once your puppy is comfortable with eating his meal in his crate you may close the door. Open it as soon as your puppy is done eating. Gradually leave the door closed longer before letting your puppy out after his/her meal. What if Your Puppy Whines or Barks? Don’t let your puppy out if he whines. That will only teach your puppy that by whining you will open the door and let him out. Learning this, your the puppy will whine as long as it takes for you to open that door. The appropriate way to handle this is to open the crate door, when your puppy has stopped whining. This teaches your puppy that he will be able to join you outside his crate, only when he is relaxed and quiet. This video of Doggie Dan and his new puppy Moses. It illustrates puppy behavior and Dan shows you how to handle the whining. Click here now to access more online Doggie Dan training videos and to sample Dan’s online training for just $1 for 3 full days of viewing. 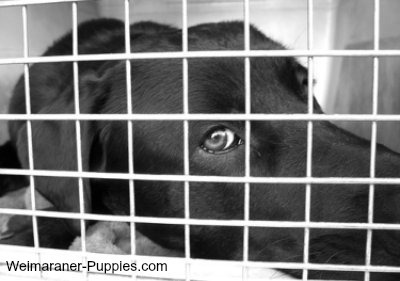 Teach your puppy to stay in the crate for longer periods of time. Once your puppy is able to eat her meals in the crate without any stress or anxiety, you can begin crating her for a bit longer while you are at home. Use a single word for a command to teach your dog that you want him to go into the crate. We use the word “crate” for our Weimaraner, but you can use “kennel” or “box”, or any other appropriate name. Give your puppy lots of praise and a treat as soon as he goes in the crate on its own. Start by confining him/her in the crate for 10 minutes. During this time you should be quiet. Sit in the same room for a few minutes. Then leave the room for a couple of minutes. Let your puppy out of the crate when you return and give him/her lots of praise. Repeat this process often throughout the day, gradually increasing the amount of time that you are away from the crate. When your puppy is comfortable in her crate without being anxious, try leaving the house for about 30 minutes. Be sure to let your puppy go potty in her designated spot before you put her in the crate! Don’t be dramatic about leaving, and try to keep your leaving routine brief. If you make leaving a big deal your puppy will too. And trust me, you don’t want that. When you return don’t get all excited because that will get your puppy rambunctious which will teach him that it’s OK to be crazy when you get home. Continue to crate your puppy for short periods of time while you are still at home, so that he doesn’t associate being crated with your leaving. A puppy older than 6 months generally has better control over their bowels so they are able to withstand being crated for longer periods of time when necessary. We used to commute to work and were gone almost 12 hours a day. In cases like that it is very important that you have a dog walker or a trusted friend or family member let your dog out to stretch her legs and to go potty. If you have just adopted, inherited, or rescued an older dog, the rules of crate training are the same as they are for a puppy. The key point is that crate training should be a happy experience for your dog, so take things slowly if your dog has trouble getting used to the crate. Never crate your dog with a choke collar on and/or leash attached. This could result in your dog hanging itself out of frustration of being confined. Never crate your dog with toys that are easily destroyed or toys that could be choking hazards. Don’t let children play with your dog while he/she is crated. And don’t let children use the crate as their own playhouse. To keep the crating experience a happy one for your Weimaraner, make sure your dog gets plenty of exercise before and after being crated. Don’t abuse the crate, follow the rules of crate training and your dog will have a safe den that he/she will be happy to be in.